Did you know that everyone around is a slave to the system, that the system you trust and follow might collapse at any given point, leaving you and your family without food and shelter. Well, I am here to teach you the methods that will make you indepedent and give you the tools to safeguard your family. YES! I want to get instant access to THE SYSTEMATIC SURVIVAL and prepare myself and my family for the coming future.. I understand that I am risking absolutely nothing today, because The Systematic Survival is backed by a 60-Day, Money-Back Guarantee. If The Systematic Survival Plan doesn't get you thrilling results and exceed your expectations, then we don't want to keep your money. If you decide that The Systematic Survival Plan isn't right for you, simply send us an email and we'll refund every penny to you. We only ask that you go through the entire course, apply the lessons, and revisit the material regularly for the first month. 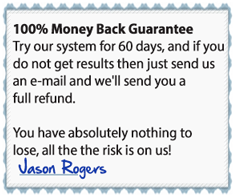 If you still don’t see massive results by then, contact us for your full refund and you will receive it within 3-4 business days. 1. Is The Systematic Survival Plan going to work for a someone like me? My situation is a bit different from the norm. Remember, The Systematic Survival Plan is backed by hard science. It's been filed tested and approved by people who actually survived various crisis. These experts actually live their life, they're committed to their lifestyle change. If you follow our method and be committed, it will work for you. 3. What is The Survivor’s Blueprint Community Center? 5. What Will Show Up On My Billing/Bank Statement? 6. How Soon Will I Get Access to the Program? Fill out your billing information on the next page, click a button, and you will immediately be taken to a private page where you can access The Systematic Survival Plan. Literally 30 seconds from now you can have all of these secrets laid out in front of you. Let's hear them! If you have any questions about ordering, or even questions about what the groundbreaking The Systematic Survival will do you for, contact us at: support [at] systematicsurvival.com. We will be happy to answer anything you want to know.